Frank Gorshin as The Riddler from the Batman television series. 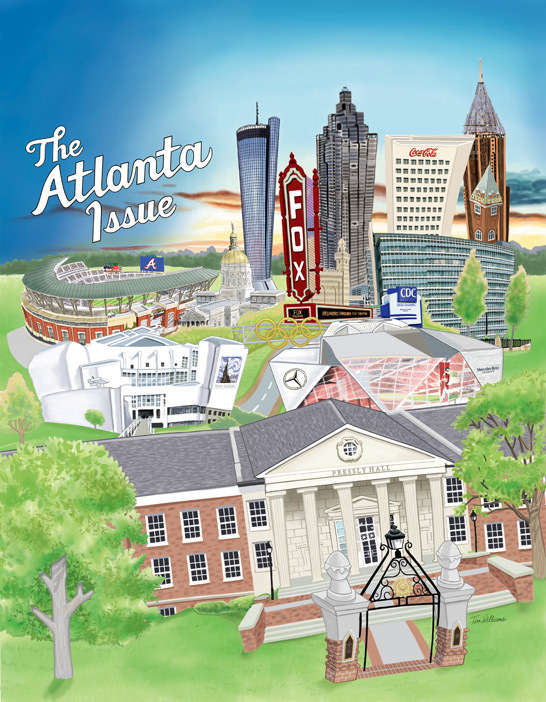 Magazine cover illustrated for Westminster, a private school in Atlanta. David Bowie was a true artist. My art tribute. I won my first Addy Award for this illustration, done for Tallahassee magazine. A couple of years ago the now defunct NFL magazine hired me to do this editorial art about Chicago fans. I've started illustrating Turner Classic Movies Star of the Month for their Twitter fans. Hepburn from Breakfast at Tiffany's. Piece done for an African-American greeting card company in New York. I illustrated this piece for Bethesda magazine. Article was about realities vs. fantasies with online dating. I painted this fold-out cover for Bartender magazine 10 months before the terrible 9/11 attacks. This art accompanied a magazine article about a woman's memories of growing up on a farm in the 1940's. This started out as a Bartender magazine cover and was eventually made into a poster. One of several covers I illustrated for Business Tennessee magazine. This one featured entertainer and philanthropist Dolly Parton. Interior art done for Business Tennessee magazine. Always liked this piece because it was created in Illustrator. This acrylic painting was done for a financial firm in Atlanta. This illustration of a sax-playing scarecrow won me an Addy Award. A Star of the Month illustration for Turner Classic Movies. Recently a client asked me to produce an infographic for her magazine. I realized I didn't have much in the way to show her as samples for that kind of work. I did this graphic as an example to show her. A personal piece I did of one of my favorite actors Boris Karloff.